Dial 1800WESUCK at customer service! The exasperation of my freight team in dealing with MEGA shipping companies and their so called "customer service" through centralised 1800 numbers and websites is getting overwhelming. It is to the point where we are actually avoiding doing business with them because it's near impossible anyway and it affects our ability to deliver the standard of service our customers are used to from us. Here's an example from one carrier on a recent import shipment to Australia. - We receive a computer generated email telling us the freight charges are available online at their website. What the??? If the computer can generate an email to us telling us the charges are available online then why can't the computer just email them to us in the first place? Stupid! -So we go the website we are directed too from the email. But of course for security reasons you need to register as a user. Fair enough. -The registration process is completed but the access doesn't come through within a few minutes as promised. -So we call their 1800 number and say "We received an email directing us to your website but then we had to register and we still don't have access". Then we are told that they have no IT people working in Australia anymore (apparently this is run from overseas now because labor is cheaper) and we are given an email address to send a message to their IT dept to get them to complete the registration process that they should have done by now anyway. Before sending this message we ask the customer service operator on the phone if they have the charges and if they could just give them to us over the phone or email them to us directly. The operator says she does have them but she can't do this anymore and we have to use their website. Arggh! -So we email IT trying to get the registration to their website through. That was in the morning and by late afternoon we have no reply and still no access to help our client get their cargo tomorrow. -So back to the "Dial 1800ZEROCAREFACTOR customer service team". We explain that we have done everthing they ask and we still don't have the charges and access to the website and the ship is in tomorrow. We need them now so we can pay them and they can then release the cargo when our truck goes to the wharf. -That customer service person finds all this too hard and transfers us to another operator who ask's "What port this is for?". "Pt Kembla" we say. "Oh that's not me that someone else...I'll put you through" Arggh!! &^%*%!!! -We speak to the next person who says "No worries, I'll email them to you now". Simple as that. What the? Why could that person do it and nobody else could or would? Stupid! -We are still waiting on the IT dept to come back to give us access to the website but the cargo picked up on time. Unbelievable!! This is a real example and I fail to see how these businesses function at all or have any customers. I am really tempted to name them however then I'll probably hear from their legal dept. Then again, it has probably been sent offshore too and maybe I don't have to worry? "Troy – I’m here to find out why I have been charged $175 overdraft fee when I don’t have an overdraft? Troy – I’d like you to refund that please. Bank – Well, I can’t do that here sir you’ll have to call customer service. Troy – Call customer service? But I am standing here… In the outlet… At the bank… In person… Talking to you…In your office…With my statements in hand… The branch where I opened the accounts. Bank – Yes I know Mr Hazard but I don’t have that authority here. Troy – So you’re saying that someone I don’t know, that’s never spoken to me, and has no idea about my account other than what comes up on their screen has more authority to deal with me than you do, my local banker, at my local branch? Troy – You’re kidding right? Troy – So I need to go and call this number then. Bank – Yes sir, that’s what you will have to do. (Not even, let me call them for you now and tell them what you are seeking to sort out, OR, let me dial the number for you and put it through to that courtesy phone over there so you can talk to them while you are here, OR, let me talk to them first and give you a reference number so you wont have to go through all of the explanation when you do call, OR let me find someone at customer service that can help you so you wont have to waste time on the phone….. nope… here’s your card, go call them, good luck, don’t let the door hit you on the backside on the way out)"
So I sympathise with Troy as we are basically in the same boat with some of the larger shipping lines. Pardon the pun! NYK is one carrier that is really looking well ahead into the future with it's concept of the NYK Super Eco Ship. This project they hope will be delivered by 2030 and will radically improve carbon emissions by about 69% compared to a cargo ships as we currently know them. The vessel is planned to be able to carry about 8000 TEU's (twenty foot equivalent units). 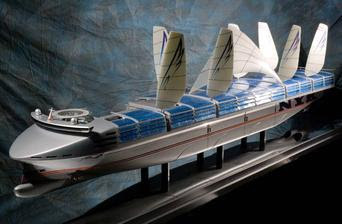 This bold project and leap into the future will potentially see ships powered by a combination of LNG-based fuel cells, solar cells, and wind power. The main power unit is planned to be a 40,000kw LNG fuel cell. The hull design also comes in for a major overhaul with reducing friction through the water being the goal followed by weight reduction. The design of hull means it is longer and wider but it has a shallower draft than most vessels currently operating now. This draft will also assist the Eco Ships with getting into ports with draft restrictions. I'm not sure what happens to those sails when the containers are being loaded and discharged. I know some wharfies would see them as a prime target for the gantry crane. Full marks to NYK for their investment, innovation and effort to drive change in the industry. World shipping lines are in emergency mode. I read a recent article in Lloyds List which reported that world shipping is in emergency mode at the moment due to the GFC. Something I have eluded too in previous posts. Governments around the world are being forced to put rescue packages together to save some of the worlds largest shipping lines as they progressively lose support from their bankers. The banks are pushing for greater loan guarantees and securities as the financial performance of many shipping lines wane. France is the latest to put a Euro 1.5 billion lifeline together for the French shipowners. The aim of this funding is to help them meet the demands of their banks. Germany(Hapag Lloyd), Chile(CSAV) and Israel(ZIM Lines) have recently taken other measures to save their carriers. The Baltic Dry Index continues it's downward trend since June and global cargo volumes are still extremely low and falling in many tradelanes and sectors. Not surprising really. With the GFC global consumption overall is still falling so it stands to reason the need to transport goods will keep falling in line with this so talk about a recovery in the shipping industry, particularly with the container, tanker and bulk carriers is overly optimistic and premature in my view. At least the RoRo and heavy lift operators that I primarily deal with are telling me their cargo volumes are improving in some tradelanes. By the way...how can the stock market keep rising globally when consumption is falling too? Top line revenue growth isn't really there. And...what are the real unemployment figures if you add back the explosion in casual and part time employment in most countries? Surely the person that has been cut back to three or four days a week isn't able to spend as much and somehow this needs to be taken into account? And...why are property values climbing in some countries at same time unemployment is as well? All doesn't make sense to this humble shipping bloke and I reckon something has to give and this whole crisis is far from over. One thing is for certain. Unless global cargo volumes start to rebound very soon we are going to start losing some of the biggest names in the shipping industry and alot of competition with them. Bad news for us all.